The money will hire a professional fundraiser to come up with several million dollars to turn two city blocks on the east side of downtown into a park. Ryan Cos. 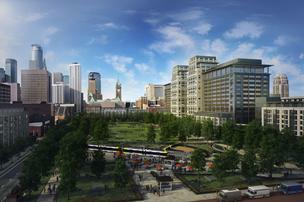 US Inc. kicked off a drive to raise funds for a new green space in downtown Minneapolis with a $200,000 donation. Ryan Cos. has said it would take the lead on fundraising. The Minneapolis developer recently won rights to build an apartment tower near the new Minnesota Vikings football stadium. Ryan is also developing two office towers along the would-be park. The pledge was made in a letter to the Minneapolis Downtown Council by Tony Barranco, Ryan’s vice president of development. City Council Member Jacob Frey posted the letter on Facebook and said he negotiated the donation. A new 501(c)(3) entity called Greening Downtown Minneapolis has been formed to raise the funds, according to the letter. Barranco could not be reached for comment. Rybak called the donation the beginning of the momentum needed for a public campaign to raise money, but backed off his $10 million estimate. The Vikings have already kicked in $1 million. Ryan paid $3 million for development rights atop the parking ramp, and that money will also go toward the park, although it’s about half of what Ryan originally proposed. This entry was posted in Downtown East Park on September 28, 2014 by citoyen1789.